If there's one thing that has surprised me about being a mom, it's that my world is so much bigger now than it was before I had children. I'm interested in so many more things than I was before. I never knew just how much I loved football and Legos and electric guitar music and robotics and cars and . . . and . . .
. . . college basketball. Today, there are a couple of things I've just gotta say. The world has not seen the last of Gordon Hayward. This guy is only a sophomore at Butler University. He is just plain amazing--a really, really talented player with a really, really talented coach. Wow. The world is a better place because of Da'Sean Butler. If you watched Saturday night's semi-final game between West Virginia and Duke, you know that Da'Sean injured himself as he was going for the basket. The referees called a charge on him, but that was the least of his troubles. He planted his left leg too hard and tore his ACL. Perhaps you've seen the touching footage of his coach's trying to comfort him as he lay on the floor, writhing in agony. I've read a lot about Da'Sean in the last couple of days, and I'm impressed that he's truly a great person, not just a great player. The kid in the cap right in the middle of the screen? That's my son. I took a still photo of our TV one night when his picture flashed on the screen. 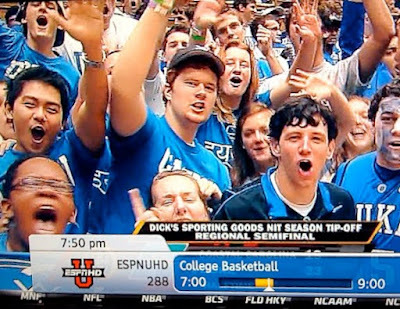 He was one of the lucky Duke students who got to travel to Indianapolis for the Final Four, so he was at the game last night. Whew! What a night! What about you? If you're a mom, do you find yourself interested in things that you never cared about before? I enjoyed your post today. It's amazing how children change and shape our lives. Their interests become our interests. It's just another way to bond with them! I'm a new follower and have spent the past 30 minutes or more reading your blog. Great posts! I'm not a sports fan by any stretch of the imagination, but our son taught me to love soccer and cross country (at least as long as he was participating). Because of my daughters, I've read Harry Potter and Twilight, discovered Mod Podge and Cricuts, and of course blogging! It is so fun discovering our childrens interest and playing along with their make beleive play time. I have a 4 yr old that loves to play a "Mommy" and a 7 yr old that loves all sports. We are her biggest fans! Enjoy this lovely day! Very interesting post. I know if it wasn't for my children I wouldn't know what a Nintendo was, and thanks to them, have been quite a good game player in my day, although I don't understand the Wii at all! Also, having boys meant I knew a lot about football (soccer) as all the family are big Manchester Utd fans. I can converse with men about who was off-side etc with confidence! They certainly can change our interests over night, making it exciting and interesting! Your son is a cutie - great photo! i never really thought about how much my world has grown until today. so thank you! you are one smart cookie :) and i love love love that you caught your son on tv! that is way cool. i was on my way to work today and heard that duke won last night and you wer the first person i thought of! 2nd thought? your son & that tent :) love ya! I was never much of an athlete, but through my children I became a great fan-football, basketbball, soccer, softball, volleyball and now shotput and discus! I play video games and watch Sci fi with one and Austen with the other. Yes, it is unbelievable how our children enrich our lives! Yay, Duke-what a game! Great pic of your son!